This brief outlines how energy infrastructure can be sustainably and responsibly facilitated by giving necessary attention to land tenure and property rights. It focuses on how to address land tenure and governance issues in connection with such projects to reduce risks, avoid potential harm, and provide benefits to local communities. The first section lays out the opportunities that energy infrastructure development can provide for economic growth and the risks that such development poses to those with legitimate land rights. The second section provides a short introduction to land tenure concepts, describes the most common ways that governments or private parties acquire land for energy infrastructure projects, and also discusses why secure tenure is important for all affected stakeholders. The third section focuses on the extent to which projects utilizing specific energy sources require land and the potential impact on local landholders and users. In the fourth section, the brief delves into the impacts of power projects on specific land tenure issues and vulnerable land users, and it sets forth some suggested best practices. The fifth section reviews risks and provides a summary of recommendations to reduce these risks. Global consumption of energy is expected to increase by 37 percent by 2040. Growth in demand is driven by a variety of factors, including increasing urbanization and industrialization and rising incomes, especially in China and other emerging markets. Developing countries, in which well over a billion people have little or no access to electricity (MCC 2015), will be the primary drivers of growth in energy consumption worldwide. Latin America alone will need to double its generating capacity by 2050 to meet projected demand (IEA 2014; Vergara 2013). Increased access to energy—as well as the roads and other ancillary infrastructure that is required for new utility-scale energy projects—can help grow economies, build human capital, and contribute to development worldwide. Energy generated from renewable sources, such as wind, hydro, solar, and geothermal, not only provides for important electricity needs but also reduces greenhouse gas emissions that contribute to global warming. Such clean energy development can provide an economic boon, especially in Africa, where research suggests that renewable sources can provide all of the power needed by the continent at a reasonable cost (see Box 1). One study estimates that clean energy investment alone could increase real GDP in Kenya by 12 percent by 2030 and lift 3.1 million Kenyans out of poverty (IRENA 2014; Ombok 2014). Worldwide investment into renewable power and fuels1 in 2014 reached $270 billion, a 17 percent increase from the previous year; and investment in developing countries was almost as great as in developed countries ($131 and 139 billion, respectively) (FS-UNEP Centre/BNEF 2015). Countries such as Indonesia, Chile, Mexico, Kenya, South Africa and Turkey all saw more than $1 billion invested into their renewable energy sector (Ibid). In 2014, nearly half of the net power capacity added worldwide was made up of renewables (National Geographic 2015). And it is likely that investment into clean energy will only increase on the heels of the historic Climate Accord reached in Paris in December, 2015: “…the deal could be viewed as a signal to global financial and energy markets, triggering a fundamental shift away from investment in coal, oil and gas as primary energy sources toward zero-carbon energy sources like wind, solar…” (New York Times 2015). An analysis of each nation’s emissions reductions targets prepared for Paris revealed that renewable energy development was the most common strategy to meet the targets (Newsweek 2015b). Thus, clean energy development presents a great opportunity to achieve economic and environmental benefits. This is recognized by the United States’ government and other bilateral and multilateral donors, who provide support for clean energy infrastructure in a variety of places and ways. The U.S. Global Climate Change Initiative, the goal of which is “to work with global partners to foster low-carbon growth, curb emissions from deforestation, and promote sustainable, resilient societies,” includes a component that seeks to promote clean energy growth in developing countries. Another prominent U.S. Presidential Initiative (supported by 12 federal agencies) is Power Africa, which aims to add 30,000 MW and 60 million connections in sub-Saharan Africa by 2030.3 USAID is supporting the first reverse auction for utility-scale solar power in Afghanistan (SIGAR 2015), the establishment of a Clean Energy Finance Facility for the Caribbean and Central America (USAID 2015c), technical assistance for increased grid integration of wind and solar power in India (USAID 2014), and renewable energy auction support in Mexico (USAID 2014a), among many other examples. However, clean energy development (like other forms of energy development – e.g., oil and gas) also poses environmental and economic risks for local communities. Environmental impacts often include biodiversity loss and decreased provision of ecosystem services – e.g., loss of water for fisheries or to support agriculture, increased erosion or flooding, loss of cultural or recreational values, etc. In many cases, negative economic impacts such as reduced resource rights and livelihoods are also felt by local communities who own, occupy, or use the land on which projects are situated. Those with insecure rights to the land can find themselves displaced and impoverished when their land is claimed by the government, acquired through expropriation by the government, or lost through negotiations that reflect an imbalance of power between the local people and the project developer. Although local communities could benefit from renewable energy projects via leasing arrangements, co-investment strategies, and/or other benefit-sharing agreements, such arrangements are rare. Sector-specific guidelines have been developed for the solar and oil and gas industries. The Solar Industry Commitment to Environmental and Social Responsibility contains provisions ensuring respect for the environment, human rights, labor rights, protecting the health and safety of workers but makes no specific reference to land tenure (SEIA 2012). Representatives of the oil and gas industry participated in the development of the Oil and Gas Sector Guide on Implementing the UN Guiding Principles on Business and Human Rights, developed by the Institute for Human Rights and Business and Shift for the European Commission. The guide contains useful advice on addressing land rights-related issues that may arise in connection with oil and gas exploration and operations (IHRB 2012). Energy projects themselves also face risks: land tenure risks – i.e., the risks associated with acquiring rights to land in an environment where land governance is weak, land rights are often undocumented, or there may be pre-existing claims to land that is offered (often by governments) for sale or lease. Failing to account for these land tenure risks can create significant financial, operational, legal, or reputational risks for the investor – e.g. increased media attention for “land grabbing” and protests by local communities against a project’s development. Delayed or abandoned projects can cost developers millions of dollars. The Voluntary Guidelines on the Responsible Governance of Tenure of Land, Fisheries, and Forests in the Context of National Food Security (VGGT), as well as other guidance, such as USAID’s Responsible Land-Based Investment: A Practical Guide for the Private Sector, outline best practices for investments in land. Some specific energy sector guidance also exists (see Box 2). However, based on recent research and continued media attention to land grabbing and disputes between local communities and project developers, it appears that this guidance is rarely followed completely. Thus, tenure-related risks for both project developers and local communities still exist and can impede projects from moving forward. To understand how infrastructure projects interrelate with land tenure, it is useful to begin with a brief discussion of “tenure” as it relates to land. One frequently used definition is “the relationship, whether legally or customarily defined, among people, as individuals or groups, with respect to land.” Land tenure thus involves laws, customs, and institutions that define and govern people’s rights to use, control, and transfer land. Broadly speaking, rights to land can be divided into two categories: (1) those that are formally defined according to law (such as constitutions, national laws, and regulations) and officially documented, and (2) informal or “customary” rights that are socially recognized and applied, but which may or may not be formally recognized by the law or written down anywhere. It is important to note that the international community, including USAID, views both of these types of rights as legitimate and, as such, these rights must be respected (see more below). Customary land rights are usually practiced by self-identified, often sub-national, groups based on the group’s traditions. They are usually unwritten, unknown to outsiders, and may even be inconsistent with formal law. Although the amount varies widely from country to country, a significant percentage of land rights are defined by customary law in many settings. This is especially true in Africa where local communities own or control a large amount of land – e.g., as much as 75 percent of all land in Tanzania is held customarily – but only a small percent of that land’s ownership is formally documented. The interaction of formal and customary systems can lead to disputes over rights and access to land. Land rights can be held individually, collectively, or communally. In fact, there are many scenarios where there are overlapping tenure rights to the same land. For example, in many countries the state legally owns land that has been used for generations by local communities based on customary rights. Similarly, pastoral communities may have negotiated rights with local farmers to use a particular area seasonally for grazing their livestock for generations without any formal, documented property rights to that land. Settled farming communities in the area may respect these undocumented seasonal rights but the government or outside investors may not. As suggested above, customary land rights can be more insecure than formal rights because they may not be recognized by statutory law and, even if they are recognized, may be undocumented so that rights may be difficult to enforce. The Voluntary Guidelines on the Responsible Governance of Tenure of Land, Fisheries, and Forests in the Context of National Food Security (VGGT) is the leading international instrument on responsible land-based investments. The U.S. is signatory to this non-binding instrument, in addition to almost 100 other countries, and the VGGT is viewed as setting forth best practices for investment in land, forests, and fisheries. According to the VGGT, “[r]esponsible investments should do no harm, safeguard against dispossession of legitimate tenure right holders and environmental damage, and should respect human rights.” “Legitimate tenure rights holders” include those with “customary tenure rights that are not protected by law” but seen locally as legitimate and practiced by communities for a significant period of time. In countries where the federal government has the legal right to lease land to energy project developers – but where the land may already be occupied by farmers, pastoralists, or others with customary tenure rights – it is possible to set up benefit-sharing arrangements with the local communities and national governments. For instance, local communities can be paid for wind turbines that are located on their land – e.g., $4,000 to $8,000 per wind turbine; $3,000 to $4,000 per megawatt of capacity; or 2-4% of gross revenues, according to Windustry (a nonprofit that provides information, technical resources, and interactive tools for the development of small and community wind). These payments can be shared between communities and the government, or they can be directed to the communities if a separate agreement can be made with the national government. The idea behind such benefit-sharing possibilities is not to make an investment more costly for project developers but rather, to ensure that local communities benefit from – and can be advocates of – clean energy development. A few examples of such benefit- sharing arrangements are provided in subsequent sections and boxes. Broadly speaking, to avoid harm to customary land rights’ holders, those involved with energy infrastructure projects must: (1) identify and recognize all land rights, both formal and customary; (2) assess potential negative impacts the project may have on those rights; and (3) modify the project to avoid harm. Projects would also ideally create benefits for local communities, no matter the type of tenure they hold (see Box 3). How do energy project developers acquire the land they need? There are three common scenarios. First, governments sometimes utilize formal legal processes to acquire land from owners or users who have legally recognized and documented rights to the land. Usually, such rights fall into the formal rights category described above but this could also include legally recognized customary rights. The government may purchase the rights from voluntary sellers or resort to expropriation procedures where involuntary sellers are compensated and resettled in accordance with national law. This is done pursuant to what are sometimes called “eminent domain” or “compulsory acquisition” laws that apply to projects that are deemed to be for a public purpose. In such cases, the actual project developer could be the government itself or a private entity, pursuant to some sort of public-private partnership (such as a build-operate-transfer arrangement) or through a relatively straightforward sale or long-term lease (Lindsay 2012). In the second scenario, the government takes land being used primarily under customary tenure that is not formally recognized by or documented under statutory law. In these cases, expropriation laws often do not apply, so existing land users are forced to either accept energy development on land they have been using, often for generations, or must move away and may or may not receive any compensation for decreased ability to use land as they once did or assistance in relocating. This is often the case with government-owned land used customarily by local communities without documented rights as described above. Here, too, the developer could be public or private. The third scenario is where a private developer acquires land rights directly from private owners or users without government intervention. These transactions should be entirely voluntary, and government or other landowners should not apply pressure on rights’ holders to agree to the developer’s offer. The fairness of the transaction will depend in part on the capacity of the sellers or lessors to negotiate a reasonable deal. In much of the developing world, people depend almost entirely on land for access to food, water, and shelter. Land is often directly linked to livelihoods and social structures and can have great cultural significance to people who live on it; and this is especially true for indigenous peoples and other ethnic communities. Thus, energy infrastructure projects that deprive people of access to land may be very harmful at the local level while providing macro-level benefits associated with increased availability of electricity. Preben Maegaard, the former President of the World Wind Energy Association and the co-founder of the Nordic Folkecenter for Renewable Energy, says, “The decentralized nature of renewable energy requires new organizational structures and alliances, that’s the role of coops. When local people own the wind farms, and share in the benefits, they will support them. It won’t be NIMBY (Not In My Back Yard), it will be POOL (Please On Our Land)” (Wind-Works 2005). As one senior corporate executive has observed, land-based investments—whether for energy infrastructure, agriculture, or other purposes—that “ignore the interests of local communities and the local landscapes are both morally wrong and commercially short-sighted.” Rights to land and natural resources are among the interests of local communities that must be respected by governments, development agencies, investors, and, indeed, all who seek to acquire the rights to use land occupied by those communities. The importance of respecting and strengthening local land rights through effective due diligence, assessments, and community consultations is reflected in widely followed standards and guidelines, such as the VGGT and the International Finance Corporation Performance Standards on Environmental and Social Sustainability (IFC 2012). These standards and guidelines apply to many types of energy, infrastructure, and other types of projects, and there are evolving social and environmental safeguards developed for energy projects in particular – e.g., Equitable Origin’s EO100TM Standard. Also, although standards and guidelines focus mainly on “do no harm” principles, it is important to recognize that the ideal scenario is to create win-win outcomes for local landusers, project developers, and broader economic growth – e.g., through benefit-sharing arrangements with local communities, who would then likely become proponents of such projects (see Box 4). Projects—for energy infrastructure or otherwise—in areas with weak land rights and land governance are more likely to encounter land conflicts, which can be very costly. In the mining and extractives sectors, disputes over land have led to project stoppages costing hundreds of millions of dollars per year (Franks 2014). A 2013 study of 52 energy and mining companies by First Peoples Worldwide found that land-related conflicts are frequent, long lasting, and can have seriously negative financial and operational effects on the projects and the companies who operate them (First People’s Worldwide 2013). And a recent study of 39 large-scale agricultural investments conducted by UNCTAD found that the most commonly cited negative impacts of those investments were grievances and disputes resulting from reduced access to land (Mirza, et al, 2014). Energy infrastructure projects are more likely to take place and less likely to have a negative effect on local land rights’ holders if both local communities and investors alike have secure tenure. Viable projects depend on having secure rights to use the land required for the project. What is more, investors are likely to face less risk and a greater likelihood of a reasonable return on their investment in settings where all legitimate land rights—formal and customary—are secure, as the project is less likely to encounter conflicts over land or challenges from people whose lives have been adversely affected. Indeed, research increasingly shows that failure to take steps to respect land rights can have very expensive consequences (see Box 5). For example, The Munden Project released a widely-read report in 2012 that found that the cost to investors of ignoring local land rights resulted in financial harm ranging from huge increases in operating expenses to outright abandonment of the project (Munden 2012). In short, energy and any land-based projects are more likely to be successful if all stakeholders— investors, local communities, and governments— benefit. This section looks more closely at the land requirements and land tenure implications of energy projects utilizing the following energy sources: hydroelectric, solar, wind, geothermal, and natural gas. However, note that these land tenure implications are also very relevant for any and all energy infrastructure projects – generation, transmission, and distribution. Costa Rica boasts four electric cooperatives that represent about 15 percent of the total electric distribution market in the country and roughly 40 percent of the rural- area service (NRECA website). Two of these coops (originally funded by USAID) have been functioning for 50 years and, together, they serve more than 145,000 member- owners and own about 85 megawatts of hydroelectric and wind energy generation resources (NRECA 2015; CONELECTRICA 2015). In much of the world, hydroelectric power currently represents the lowest cost renewable energy source (IRENA 2012). Local populations have the potential to benefit from access to the electricity generated by hydro projects and through benefit sharing (see Boxes 6 and 7). But hydroelectric storage projects frequently and directly affect huge tracts of land, both for the dam and for associated infrastructure such as roads and structures for construction, operations, and maintenance. Large land areas may also be flooded or otherwise made unsuitable for habitation, farming, fishing, or other human activities. These negative effects of dams that can decrease livelihoods – e.g., fewer fish to catch, less water for subsistence or cash crops, etc. – may be felt in the immediate area as well as for miles up- and down-stream. River diversion hydropower projects are considered by many to have a smaller environmental and social footprint than storage hydropower projects. However, this is not always the case, as they also require infrastructure similar to hydroelectric storage facilities (e.g., impoundment structure, transmission lines, access roads). In both storage and river diversion hydroelectric projects, communities upstream and downstream of the impoundment (including along the diversion reach of the river) can be significantly impacted. As a result, dams that provide electricity to millions can also have a negative effect on the livelihoods and well-being of communities both living on the land affected by the project and downstream. These projects often involve compulsory acquisition and sometimes forced eviction. While those with secure tenure whose land is taken may receive fair compensation and be resettled in areas that improve their livelihoods, in practice this has often not been the case. And those with insecure rights are even more likely to lose their land without compensation and not be adequately resettled. For example, development of the Xayaburi dam on the Mekong River in Laos began in 2012 and appears likely to have seriously negative effects on communities living upstream and downstream of the dam. The dam threatens the availability of fish on which millions depend for their nutrition and livelihoods, and it will flood thousands of hectares of productive agricultural land and impact recession agriculture downstream. The Xayaburi developer reportedly has not complied with laws requiring it to fully compensate and relocate those with both formal and customary land rights (Herbertson, K. 2012; Centre for International Security Studies 2013). On the other hand, the developers of the Chilime hydropower project in Nepal (see Box 7) took a different approach, as did the Kandadji dam and irrigation project in Niger. The Nigerien government worked with the Global Water Initiative (a multi-stakeholder partnership that promotes improved “water management policies, research, investment and knowledge resources for sustainable agricultural production and improved food security”) to consult extensively with those who will be displaced by the project and to obtain their consent. They are providing compensation to those with customary rights in the form of an innovative perpetual lease of alternative land. But even this project has faced challenges related to fairly compensating and relocating approximately 38,000 people whose land will be inundated when the dam is complete. For example, it has been difficult to determine the relative values of the land that people will lose for purposes of providing them with an equivalent amount of replacement land. Relocated farmers also face potential difficulties in adapting their farming practices to new land that is suitable for different crops than they have traditionally cultivated (Global Water Initiative 2015; Skinner 2013). And the project has been silent as to the potential impacts of the project on pastoralists. The Chilime hydropower project, developed by the Nepal Electricity Authority (NEA), is a 22 MW run-of-river project on Chilime River. As part of benefit-sharing with communities, a local Nepalese bank provided loans to project-affected communities so they could purchase shares in the project. Prior to purchasing shares, the NEA undertook a major education campaign so local people would understand the process and explain what “shares in the project” actually meant. Other residents of the district were also able to purchase shares, albeit at a higher price than the project-affected communities. There was no official monitoring on how this improved peoples’ livelihoods, but people did buy housing/land, educated their children, and used the shares as collateral for bank loans. Anecdotal discussions with project-affected villages indicated that up to 75 percent of households purchased stocks in the Chilime hydropower project (USAID 2016 – forthcoming). The local school was also given shares in the project in exchange for allowing the school’s land to be used for a sand quarry (conversation with Dr. Dambar Nepali, who was involved in the project’s design and development, March 8 2016). The Chilime project also compensated local project-affected people by acquiring their land for prices that were higher than the market rate. This helped such individuals pay back loans from the Agricultural Development Bank that had been obtained by using land as collateral but which most people had been unable to pay back. Any leftover funds were then primarily used by local people to continue farming on their remaining land (Conversation with Dr. Dambar Nepali, March 8 2016). Large, utility-scale solar projects (primarily large photovoltaic or concentrated solar power systems) are also very land intensive, requiring large areas of flat land. Such areas are often also ideally suited for agriculture and grazing. As with other types of land use, those with insecure tenure are at greater risk of harmful displacement by solar projects. Communities or individuals with customary, seasonal rights, such as nomadic or pastoral communities accustomed to grazing their livestock in the project area during certain parts of the year, may lose access to the land. If such pastoralists’ land rights were strengthened and documented, however, they could potentially benefit from leasing a portion of their land to solar (or wind) project developers. In the ideal case, they could lease out the less-desirable grazing areas to such projects and continue using the more desirable land for grazing. As pastoral communities are often amongst the poorest populations, this type of benefit-sharing arrangement could help to lift them out of poverty. Those with already-secure land rights may also potentially receive income from higher purchase prices or rents than would otherwise be available from other buyers or lessees. Context matters of course, and projects should undertake careful due diligence to identify potential impacts on project stakeholders. USAID has recently developed guidance for private sector investors in land to strengthen engagement with communities (USAID 2015b), and this and other guidance has been collated into the recently published Analytical Framework for Land-Based Investments in African Agriculture (New Alliance 2015), which – despite its name – can be utilized by investors in any geography investing into any type of land-based project. One of Power Africa’s partners is Gigawatt Global in Rwanda, a utility-scale solar project that started operations in February 2015 (USAID 2015a). The project received financing from the Overseas Private Investment Corporation via its Africa Clean Energy Finance program. The company leased land for the project from the Agahozo-Shalom Youth Village, a residential community and farm established to care for Rwandan orphans. The Village uses lease revenues to help cover its expenses. The firm is also teaching local high school students about solar power (Whitlock 2015). This project is an example of a benefit-sharing approach that could be widely replicated. Wind projects require less land than most hydro or large-scale solar projects. In fact, a wind project may actively use only 10 percent of the total land area covered by the project (Jacobs 2009). This is because the wind turbines, transmission lines and buildings occupy only a small portion of the land area. Thus, in most wind projects, the existing landowner or user can continue to use most of the land for farming, grazing livestock or other activities so long as they do not interfere with the operation of the facility (and vice versa). Operators and local land users may be able to share roads used by the project (Stoel Rives 2014). However, this is not to say that land rights issues cannot and do not arise in conjunction with wind power projects. Wind projects in Oaxaca, Mexico have been plagued by protests by members of indigenous communities charging that their land rights were not fully respected and that they received unfair compensation. In one case, protestors seized the local town hall and blockaded the site of one project and another has seen threats of violence (McGovern 2012). In the case of the Lake Turkana Wind Power Project (see Box 12), a local community group has filed a lawsuit to have the project’s land titles or leases revoked. The community group claims that these titles or leases were issued illegally, as the local communities have been using the land for decades and have customary tenure rights to the land. Here, then, as with all land-based investments, engaging in a due diligence process that truly ensures respect for legitimate local land rights can increase the likelihood of project success. And it should be noted again that renewable energy projects such as wind farms can benefit both local people and project developers via cooperative models, as has been demonstrated in Germany, Denmark and other countries (see Box 8). Denmark is an international leader in wind energy development, and on July 9, 2015 (a particularly windy day), the country produced a record 140 percent of its national electricity needs (excess supply was sold to Germany, Norway and Sweden) (The Guardian 2015). In addition to public opposition to nuclear reactors, political cooperation across parties (led by women) legislated support for renewable energy development beginning in the 80s, including subsidies for new wind energy projects (Wind-Works 2005). The Danish wind industry has become an international success because of a strong domestic market and strong public support underpinned by locally-owned wind coops – by 2001, local cooperatives and individual farmers owned 85% of wind turbines (Ibid). Geothermal electricity generation relies on heat located far below the surface of the earth. Drilling operations tap geothermal reservoirs containing hot water or steam. The operators initially need land for drilling, access roads, and support structures. Ultimately a power plant must be built to convert the hot water or steam to electricity. As with other technologies, the electricity generated must be connected to the grid so that it can be delivered to users, requiring land for transmission lines. The amount of land needed for a geothermal project can be substantial, although usually less than for hydro or utility-scale solar projects. To take one example, the Cerro Pabellón plant in Chile requires 136 hectares of land plus a corridor for a 73-kilometer power line. As with other energy sources, this means land tenure issues will often arise. In addition, geothermal extraction activities have the potential to cause land subsidence if an insufficient volume of water is not reinjected into the subsurface cavity. This can interfere with or completely prevent activities on the land by the owner of surface rights. “Physical access to the resource (for purposes of drilling, power plant construction, roads, etc.) has to be negotiated with the land owner. However, in many cases the geothermal resources are in remote locations, where the state is the formal landowner… [and] there can be significant contesting of access and resource rights by local, indigenous communities. Chile, being signatory of the International Convention of Indigenous People and having its own Law 19,253 (Law of Indigenous People) has faced opposition and legal challenges to mining, transmission, and geothermal projects. Indigenous community engagement is therefore seen as an important factor by both government and private developers” (Van Campen 2015). Complicating matters, governments usually own the subsurface rights to minerals and geothermal resources. The Chilean Constitution, as one example, gives the government exclusive ownership of all subsurface resources, including geothermal. The same is true in the Philippines (Van Campen 2015). This can lead to conflicts between the surface rights holder and the government or project developer who needs access to the surface in order to conduct subsurface activities. (Similar issues arise from mining and other extractive industry projects – See Box 9.) When subsurface rights rest in the hands of government or developers, this frequently places significant restrictions on what surface rights’ holders can do with the land (King 2013). Accordingly, the potential for conflict with surface land rights’ holders in geothermal projects is very real. The rights and interests of indigenous peoples and pastoralists are often implicated in areas with geothermal resources. Indigenous communities in Hawaii, Greece, and Peru have opposed projects because they believe geothermal features have religious significance (GeothermX, Inc., 2013). Pastoral groups such as the Maasai also have maintained that geothermal projects interfere with their rights (Koissaba 2014). The land tenure issues arising from oil and natural gas projects are similar to those in geothermal projects. The State usually owns the rights to subsurface oil and gas; land is required to drill for the product (except for offshore sites), transport it to the plant, and for the plant itself. Thus, there is the potential for land-related conflicts between the project developer with subsurface rights and those holding rights to the land on the surface. Those with insecure rights are most at risk. The land areas involved can be significant. In Mozambique, the government provided 7,000 hectares to developers of the Afungi Peninsula Liquid Natural Gas project, which is intended to exploit the offshore Rovuma Basin natural gas field. Reports indicate that 3,000 people will be forced to relocate (Salcedo-La Vina 2015; Maylie 2014). The Tullow Oil project in Kenya’s Lake Turkana represents one example of the challenges and opportunities that can arise in an oil exploration project. The early stages of the development were marked by widespread disagreements with the local population related to environmental impacts, employment, and other matters. Violent protests led to a suspension of the project. But this has led Tullow to make a number of high profile commitments to engage constructively with the local communities, the company having recognized the importance of obtaining long-term local support for this project (Economist 2015; Greenspan 2014). As suggested above, a host of land tenure issues can arise in connection with energy project development. Indeed, virtually any type of large-scale land use can pose a threat to those with insecure land rights in settings where land rights and governance are weak. The result can be opposition and perhaps conflict that can delay or even undermine the project. This section of the brief addresses some of the most important such issues and lays out best practices for responding to each. Pastoral communities13 frequently hold land based on customary practices. They herd livestock on which they depend for some or all of their income and depend on access to pastures, water sources, and land corridors that enable them to move throughout the year. “[M]any pastoralists in developing countries lack clear property rights because they occupy customary or tribal rangelands that are legally owned by the state… or are claimed by other interest groups.” Of the 200 million pastoralists worldwide, about 180 million live in developing countries (USAID 2013). Like others with customary land rights, pastoralists with insecure tenure can be harmed by large energy projects that interfere with their access to the land and resources they need to survive. Also, if projects are developed on pastoralists’ customary land without providing them with benefits (e.g., via leasing revenues, revenue-sharing agreements, provision of electricity, etc. ), it is a missed opportunity to raise their standard of living and for them to be proponents of such development (as described in Box 3). The VGGT state that pastoral communities, like other holders of customary land rights, are entitled to have their rights recognized and to be consulted about any proposed use of the land for other purposes (e. g. , V GG T paragraph 9.5). In many parts of the world, land for energy infrastructure projects is occupied by indigenous peoples. Indigenous peoples are often referred to as “ethnic minorities,” “aboriginals,” “hill tribes,” “scheduled tribes,” “first nations,” “tribal groups,” etc., and they number about 370 million people in over 70 countries worldwide. Considering the diversity of indigenous peoples, it is not surprising that no single official definition of “indigenous” has been established. Instead, it has proven more useful and relevant to use the following set of criteria in their identification: close attachment to ancestral territories and the natural resources in those areas; presence of customary social and political institutions; economic systems primarily oriented to subsistence production; an indigenous language, often different from the dominant language; self-identification and identification by others as members of a distinct cultural group. The U.S. government, however, interprets FPIC as requiring “free, prior, and informed consultation.” The more expansive interpretation of FPIC—consent rather than consultation—provides stronger guarantees that the rights of indigenous communities will be protected and also gives them the right to say no to a project being implemented in their territory, for example. There are many examples of energy infrastructure projects being proposed or developed on land claimed by and/or officially recognized as belonging to indigenous peoples. Countries are using varying approaches to addressing the rights and interests of those people. In the Philippines, Chile, and New Zealand, many geothermal systems lie in areas inhabited in large part by indigenous peoples, who have a special cultural or spiritual connection with the geothermal and other natural resources. These countries show that there are various ways of involving and rewarding indigenous communities in the process of developing geothermal power plants. Depending on historic, social, and legal circumstances, this can be through a combination of national legislation and sharing of royalties (Philippines – see Box 10) or land-ownership, access, and regional environmental requirements (New Zealand). Chile has not built any geothermal power plants yet, but community consultation is part of the Environmental Impact Assessment process and Chile is signatory to ILO Convention No 169 on Indigenous People. Developers are therefore engaging early with communities and base-monitoring important surface features, among other things, in order to facilitate future agreements when plants will be built (Van Campen 2015). “The Philippines is made up of many islands with a diverse, indigenous population and an evolving framework of sharing governance responsibilities between central and regional levels, particularly in areas with high indigenous populations. In the context of geothermal resources, this is reinforced by RA 8371 (the Indigenous Peoples Rights of Act of 1997), which confers certain preferential rights to indigenous peoples over their ancestral domains and all resources found therein. The RA 8371 requires that no agreement for the exploitation of natural resources shall be approved unless there is a prior certification from the National Commission on Indigenous Peoples (“NCIP”) that the area does not overlap any ancestral domain or that the free and prior informed consent (“FPIC”) of the concerned indigenous cultural communities or indigenous peoples (“ICCs/IPs”) has been obtained (Peñarroyo, 2010). Some of the royalties required under the new RA 9513 Renewable Energy Act (2008) are shared with regional and indigenous institutions. Investments in land often have a substantially different and greater impact on women. Women’s ability to own, control, and access land is significantly constrained in many parts of the world. Thus, women’s tenure rights are often much less secure than men, and women tend to hold rights to much smaller land areas. For cultural and sometimes legal reasons, women find it more difficult to participate in land-related decision-making. Thus, men are often in a better position to benefit while women are more likely to be negatively affected when land becomes more valuable because of an energy or agricultural investment (FAO 2013). A substantial body of evidence indicates that household food security and well-being increases when women have secure tenure rights to land and related natural resources. Thus, energy infrastructure and other land- based projects that undermine women’s land rights can have a particularly negative impact on families (FAO 2013). There is widespread agreement that responsible investments in land should respect and ideally strengthen land tenure rights held by women. The VGGT urge all stakeholders to ensure equal tenure rights for women and men. (E. g. , V GG T , paragraphs 3B4, 5. 4 and 12. 11. ) The Principles for Responsible Investments in Agriculture and Food Systems also state that responsible investments should advance women’s equal tenure rights and improve their access to land and resources (FAO 2014a, CFS-RAI principle 3). Thus, energy project developers should embed gender-sensitive processes and requirements into their project development operations. These can include steps to ensure that women’s land rights are identified and respected so that women’s access to land is not impeded, ensuring the consultations (as discussed in the next section) are carried out in ways that are accessible to women and seeing to it that benefits accruing to local communities are shared equitably with women (USAID 2015). SN Power, a company owned by two Norwegian state-owned companies, acquired the rights to develop a hydroelectric plant in Chile on lands occupied for generations by the Mapuche, the largest indigenous group in the country. In developing the project, SN failed to consult adequately with the Mapuche. Company personnel were accompanied by military and police officials when attending the consultation sessions that were undertaken. Worse, SN sought to undermine legitimate community leaders in their efforts to obtain consent from the Mapuche. Ultimately, the Mapuche successfully resisted the project, forcing the company to abandon it. Its loss for 2010 alone exceeded $15 million. Research increasingly shows that projects that do not include an adequate process of consultation, participation and negotiation are likely to incur substantially higher costs than those that do (Munden 2014; also, see Box 11). This is true for any large-scale investment in land, including energy infrastructure projects. 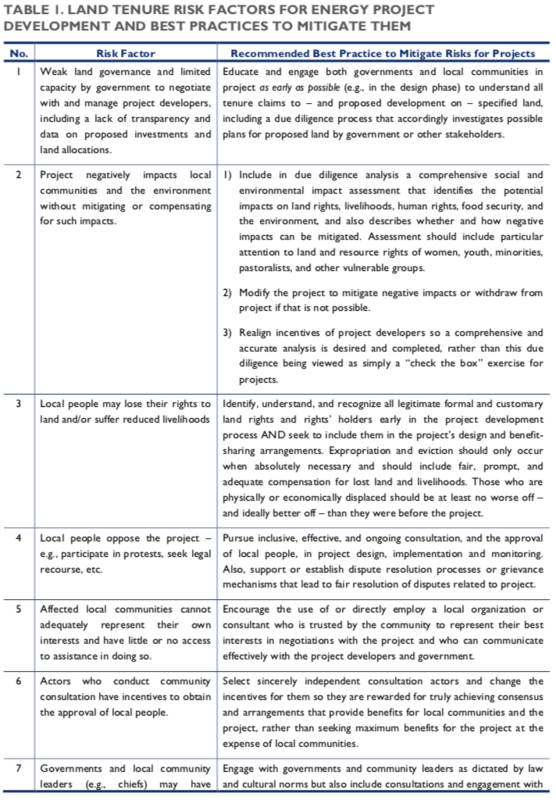 Project developers must consult effectively with communities in order to: (1) accurately recognize legitimate land rights, especially customary rights; (2) assess the impacts of the project on local land rights and livelihoods; (3) determine whether they have obtained consent to the project, including the transfer of land rights, from all those from whom it is required; and (4) establish conditions for a productive relationship with the community over the life of the project (Smaller 2014). Because of the potentially substantial costs of delays caused by opponents of the project, investing in a robust consultation process makes financial sense. The cost of doing so is likely to be substantially less than the price of responding to conflicts over land that might well have been avoided by effectively engaging with the local community from the beginning (USAID 2015). The admonition that all legitimate tenure rights’ holders be compensated is important. This means compensating all members of the affected community, including those with undocumented, customary and legitimate land rights. And compensation should not be limited only to those who are physically displaced; a project may cause economic harm to some members of the community who are permitted to remain in their homes (USAID 2015). One example would be those who rely on fishing for their livelihoods but whose usual fishing grounds are undermined by a hydropower project. They, too, should receive compensation. Where land for an energy project is transferred voluntarily, project developers should also ensure that all whose land rights, both formal and informal, are impacted are promptly and adequately compensated. Because their tenure rights are often so tenuous, women frequently receive little or no compensation. For example, women who traditionally harvest non-timber forest products from a forested area that is included in an investment project may not be compensated for losing access to those products. Compensation schemes must pay special attention to the rights and needs of women and vulnerable groups (Lindsay 2012; USAID 2015). Compensation in the form of alternative land and other non-cash compensation, perhaps in addition to cash, can be crucially important to avoid harm. Rights’ holders should be paid for the reasonable value of the land, potentially based on the future use for the energy infrastructure project or full replacement cost, as well as environmental and social harm and other losses such as the cost of resettlement and new housing, changes to employment or livelihoods (FAO 2008; Lindsay 2012). (Note, however, that it can be very difficult to determine a market value for land in settings with no active land markets.) Each situation is different and must be addressed independently. But those receiving compensation should enjoy a quality of life at least equal to and, ideally, better than what they experienced before the project. Large-scale investments in land can cause, or be undermined by, disputes over land (Munden 2012). 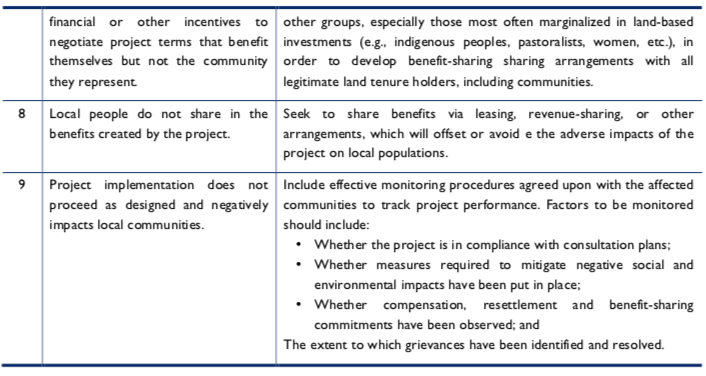 Land-related disputes can arise where project operators fail to identify and respect local land rights, consult adequately, or provide adequate compensation as outlined in previous sections (see Box 12). In such cases, the developer has a direct obligation to find a way to resolve the dispute through some sort of grievance or dispute resolution mechanism. Without adequate due diligence, energy infrastructure projects also can inherit pre-existing disputes over land. While many may expect such disputes to be resolved by formal or informal public dispute resolution mechanisms, in many countries those with grievances face significant barriers to accessing justice due to the absence of impartial, reliable, and accessible institutions and processes (Munden 2012; UNHCR 2011). These disputes can jeopardize a project even though they were not caused by the development. While the VGGT observe that dispute resolution should be the job of the government, in many countries the formal legal system does not function well. It can take several years or even decades for land-related cases to be resolved in court. Energy infrastructure project developers obviously should not seek to replace national formal justice systems; in principle, dispute resolution is the government’s job. But, where necessary, developers can and should supplement the formal processes by working with communities to create appropriate grievance or dispute resolution procedures to address land disputes arising from the project itself. Doing so is consistent with the VGGT, the UN Guiding Principles on Business and Human Rights (Principle 29) and Principle 9 of the CFS-RAI. A wind project in Kenya supported by Power Africa, OPIC, and many other donors and investors, provides a good example of the land tenure complexities that may exist in such projects. The Lake Turkana Wind Power Project (LTWP) should be able to supply 300 MW to the Kenyan national electric grid. Power from the project will not – at least initially – be available to local people because there is no local substation. The wind farm is being constructed on land used for generations by a number of nomadic (pastoral) or semi-nomadic herding communities with customary rights to the land. According to opponents, the developers acquired title to more than 150,000 acres of land, although project documents indicate that the footprint of the finished project will be less than 100 acres under a 33 year lease. Nomadic communities will continue to be able to pass through the wind farm with their livestock, with some restrictions during the construction period. The company states that it has engaged in extensive consultations with local communities and that those communities support the project. It notes the economic benefits to the local area from construction, job creation (albeit mostly temporary jobs), and improved roads. The one community that has a settlement on the site of the wind farm has agreed to temporarily relocate the settlement during construction with financial support from the company. The company has also agreed to establish and fund a foundation to provide socio-economic support to the communities. While stating that they do not oppose wind power development in the area, a local community group claims that the land titles or leases were illegally issued to the development company, and this group has filed a lawsuit to have these titles or leases revoked. The group also maintains that developers have not adequately informed or consulted with the affected communities. The cases discussed in this brief, such as the Lake Turkana wind project discussed above, reflect the existence of a number of important risk factors that are likely to affect virtually all energy infrastructure projects in developing countries. And international best practices, as expressed in the VGGT, IFC Performance Standards and other guidelines and guidance, describe what can be done in the face of these risks so that projects provide broad benefits of increased access to electricity while also benefiting – or at least not harming – local communities. Some of the most important of those best practices, many of which can be addressed through and built into project development and/or related donor support, are outlined in Table 1. For additional guidance, please reference the VGGT, the Analytical Framework for Land-Based Investments in African Agriculture, and other guidance aforementioned. Access to electricity is a powerful driver of poverty alleviation and macroeconomic development. Energy projects, including donor-supported and/or private sector-led projects, that incorporate the foregoing list of best practices will go a long way toward providing electricity in ways that respect the land rights and livelihoods of directly affected communities.